Christophe Thurnherr is a French fine artist who creates extraordinary works of art using veneers of wood. Known as marquetry, this genre was perfected by French master cabinet makers in the 17th century, to create furniture of unprecedented luxury for King Louis XIV at Versailles. This superb craftsmanship is now available to collectors of automotive art. He also had an early interest in craftsmanship, so studied art history, drawing and cabinet making. He worked as a cabinet maker with a high-end furniture company for 15 years before turning freelance. 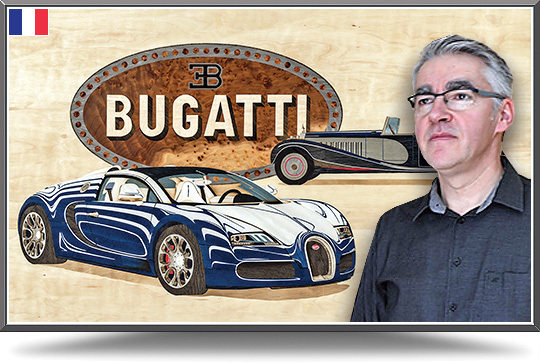 "In 2012, I decided to dedicate myself 100% to my two passions: cars and marquetry." Marquetry is a mosaic of small wooden pieces, carefully selected and treated in various ways. At least 250 pieces are required for each artwork. The most intricate use up to 2,700, requiring seven months of work. This complex process requires several stages, and is sometimes compared to the intricacies of a Swiss watch! Drawing: The process begins with a very fine line drawing, which can take two weeks. It must be extremely precise, since these lines are used to guide a very thin blade. Coloring: Some veneer sheets are dyed in a solution of powdered pigments and warm water for several days, so that the color penetrates to the heart of the wood. Only a few species are suitable for tinting, like sycamore, ash, charm, tulip tree, and pear tree — which are light, non-resinous woods with very little tannin. Assembling: The pieces are assembled following a strict pattern and glued one by one onto a very rigid, synthetic baseboard to complete the mosaic. Varnishing: This stage is very labor-intensive and time-consuming. Thurnherr sprays the wood with 15 layers of German-made, UV-resistant clear varnish, with drying and high-tech sanding in between. This deep coating of either satin or high gloss varnish preserves the wood, accentuates the colors, and gives the illusion of a three-dimensional trompe l’oeil. Polishing: High gloss varnished surfaces are polished to a mirror finish with a rotating disc of sheepskin and creams, as used on Italian Riva boats. Framing: Lastly, he frames each artwork with a carbon fiber appearance. “My quest for the 'Holy Grail' is to achieve perfection with every work of art.” In recognition of his expertise, Thurnherr’s marquetry was exhibited at the famous Schlumpf Collection — the biggest automobile museum in the world. Thurnherr enjoys portraying supercars since many of these exotics are sculptural works of art in themselves, but he can of course produce any make or model. Once selected, he studies all details of the specific model in order to best convey its characteristics in the form of inlays. His preferred style is figurative, but he can create personalized contemporary marquetry if required. All shapes and sizes are possible: from a small box to the decor of an entire wall in a hotel, plane or yacht! Commission Christophe to create a unique marquetry artwork or mural for you!